Luther C. Clark was born in Easthampton, Massachusetts on the Fourth of July 1814 to Bohan and Mary White Clark. By the time he married Julia Crawford on August 10, 1843, Samuel B. Ruggles’s ambitious project of a high-end neighborhood called Gramercy Square was well underway. Sixty years earlier, while Clark’s grandfather Enoch White was a lieutenant in the Revolutionary Army, the Gramercy Square area was part of James Duane’s 20-acre farm known as Gramercy Seat. The name was said to come from the Dutch Krom Moerasje, meaning “Crooked Little Swamp.” In December 1831 Samuel Ruggles purchased a portion of the swampy land, then spent an astounding $180,000 to drain the swamp and haul away innumerable cart loads of earth. In 1844, the year following Clark’s wedding, the park had been fenced and landscaping begun. 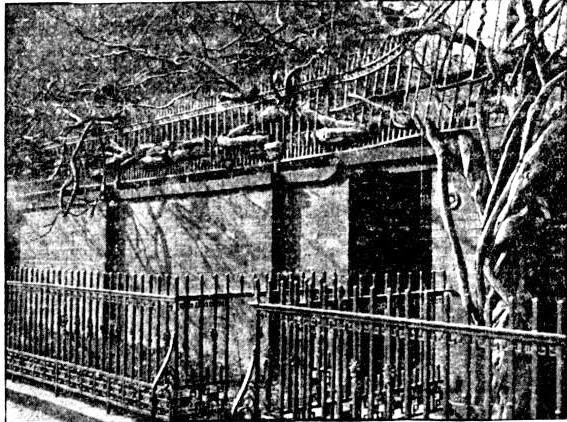 Mansions began rising around Gramercy Square. One of the handsomest would be Luther C. Clark’s brownstone home at No. 18, erected in 1853. The stately red brick home with its tall mansard roof sat on the south side of the park, at the western corner of Irving Place. Tall floor-to-ceiling parlor windows opened onto ornate cast iron balconies. Above the high stone stoop the entrance was deeply recessed behind two fluted Corinthian columns about 12 feet tall. These and their flanking carved pilasters upheld the hefty entabulature with its highly decorative cresting. Clark was, by now, a well-established banker and member of the firm Clark, Dodge & Co. He and Julia would have six children; George, Ellen, Arthur, Louis, Julia and David. On March 20, 1854, just a year after moving into the No. 18 Gramercy Square, 10 year old Ellen died. Two years later, on August 5, 1856, the family would lose 4-year old Arthur. Clark, Dodge & Co. did much of its business in gold. It was a circumstance that would cause problems. On October 1, 1864 Luther C. Clark appeared before Justice Dowling to testify against Loring W. Watson regarding one such incident. Watson had been a cashier with the firm for many years. His trusted position gave him the opportunity to embezzle $12,000 (although Clark suggested “that a close examination of their books might show a larger amount”). Watson’s take in Civil War period dollars would translate to more like $175,000 today. He attempted to make his escape on the steamship City of London on Saturday, October 1 when he realized his theft had been detected. Before the steamship left the pier, Police Captain Jourdan and Sergeant Quinn rushed aboard and arrested the clerk. They found $450 in English gold on him, “this being, probably, all that he had saved from the large amounts of his employers’ money, with which he had speculated at the gold board,” presumed The Sun two days later. As Luther Clark prepared an affidavit, Loring Watson explained that he needed the funds because “he had been drawn into difficulty solely through speculation in stocks.” The judge was unmoved by his reasoning. “He was committed,” said The Sun. When the Civil War draft lottery was initiated, the wealthiest of New York families managed to purchase their sons’ exemption. It was not the case with the Clark family. Three weeks before Watson’s embezzlement had been detected, on September 4, 1864, 20-year old George Crawford Clark’s name was drawn in the draft lottery. In January 1866 the firm of Ludwig C. Meyer sent a $5,000 bag of gold to Luther C. Clark. The New-York Daily Tribune explained two months later that it “was lost in some way between the two.” Meyer insisted that the bag of gold was delivered. Clark, Dodge & Co., said the opposite. Now, on Saturday March 17 a jury had to try to discern who was telling the truth. When Luther Clark died in 1877, only three of his six children survived him. He left an estate of $200,000—nearly $4.5 million today—of which half went to his widow and the remainder divided equally among Louis, Julia and David. 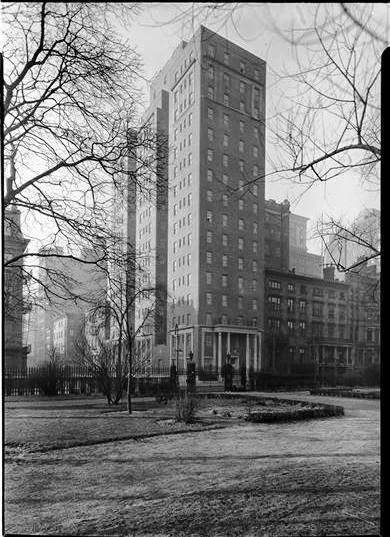 Julia, daughter Julia, and 13-year old David remained in the Gramercy Park mansion. The younger Julia was married on November 11, 1879 to Samuel Phillips Blagden in the Madison Square Church. 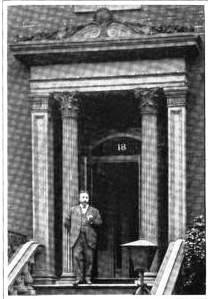 Early in 1883 Julia Clark took on Charles Byrnes as assistant butler. Not long after he arrived she noticed that little by little items were missing—“various articles of jewelry, one or two pocket-books, and considerable money,” said The New York Times. Nearly a year later she estimated that the mysteriously disappearing cash and objects amounted to more than $1,000. Suspecting that the thief was one of the servants, the shrewd widow did her own detective work. She marked a bill and left it in a conspicuous place in the house. It disappeared. Having narrowed down the field to one suspect, she called police to arrest Charles Byrnes. “In Byrnes’s possession were found not only the marked money, but one of the stolen purses and a pawn-ticket, which is supposed to represent a diamond ring valued at $600, upon which Byrnes had realized only $125,” reported The New York Times on February 3, 1884. On April 30, 1895 the 72-year old Julia C. Clark opened her house for the wedding of her niece, Alice Townsend Crawford to Richard Tighe Wainwright. The family’s social standing was reflected in the names among the wedding party—including Beekman, La Farge, Colt, Livingston and Norrie. Suddenly, on Monday November 12, 1900, after nearly half a century in the house, the 81-year old Julia Crawford Clark died in her home. Before long the block would be known for its high-end clubs. The former Potter mansion at No. 16 had become the clubhouse of the Players years earlier. Now the Clark home and the Tilden mansion at No. 15 would follow suit, becoming the Columbia University Club and the National Arts Club respectively. 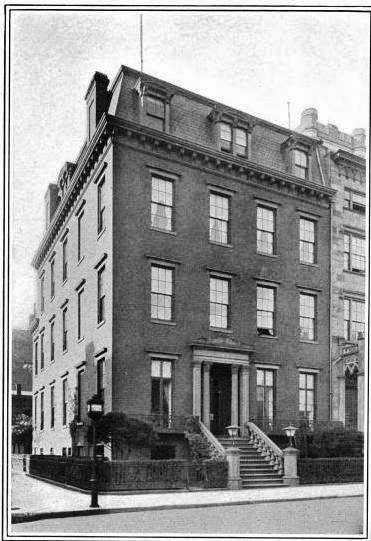 The Columbia Alumni News would later say "The interior of this venerable pile was skillfully remodeled by Architect Ken Murchison, and, on September 7, 1905, the Club put its new house in commission with appropriate ceremonies." Not long after the housewarming, an open-air dining room was constructed over the rear yard and the Clark stable, facing Irving Place, was converted into squash courts. It was here that Columbia would battle opponents like Harvard in high-class squash matches. Nevertheless “Studio apartments of this sort are at a premium in the Gramercy Park section,’ said The Times. 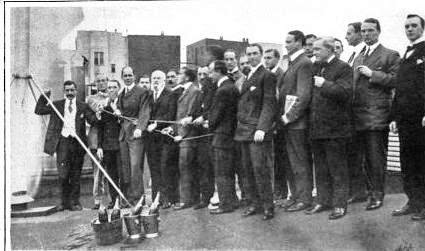 The proposed building, designed by Charles W. Buckham and D. Everett Waid, already had several apartments rented at the time of the announcement. But for whatever reason, the Gramercy Park Studio project never went forward. 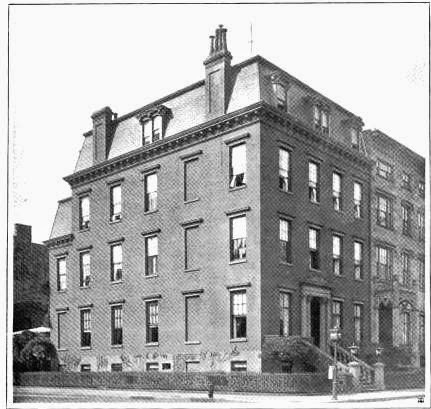 Instead the Army and Navy Club of America moved into the Clark mansion. But the love affair between the club and the vintage residence would not last. Designed by Mungatroyd and Ogden, the Parkside was completed in 1927. Women paid $3.50 a night in 1939 for one of the 300 rooms and full hotel services. Today the Parkside still stands. It was renovated in 2013 by Zeckendorf Development and Robert A. M. Stern into 16 lavish, luxury residences—one of which sold that year for $16.575 million. Another, with four terraces and two pools was purchased by Houston Rockets owner, Leslie Alexander for $42 million. The somewhat awkward looking building has survived longer than its predecessor did—a fact that proves that it is often neither architectural beauty nor historical interest that dictates a structure’s endurance in Manhattan. Thank you for posting. I never knew about this mansion. Luther C. Clark and Julia Crawford Clark were my great, great, great grandparents! Glad you enjoyed it. The Clarks were an interesting family.